In the following definition, I am denoting the condition that $a$ is not an integral multiple of $b$. Why is there such a big space between $b$ and the vertical bar with a slash through it? respectively, in the division of $a$ by $b$. If $r \neq 0$, $a$ is not divisible by $b$. The indivisibility of $a$ by $b$ is denoted by \boldmath$b \not\vert a$\unboldmath. 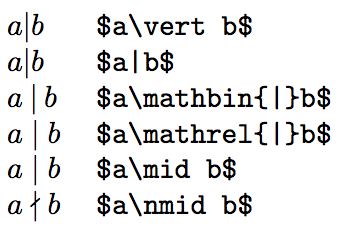 Since "divides" is a relation, the correct spacing is given by \mathrel, which is the default for \mid. The negated relation, as suggested in the comments by @egreg is given by the command \nmid. Notice that the spacing is identical to \mid. \nmid uses the amssymb package. What is the symbol “between” (≬) used for? What symbol can be used in front of a URL ? How to type “~”, the curly symbol used for “Home” in Linux, in latex?